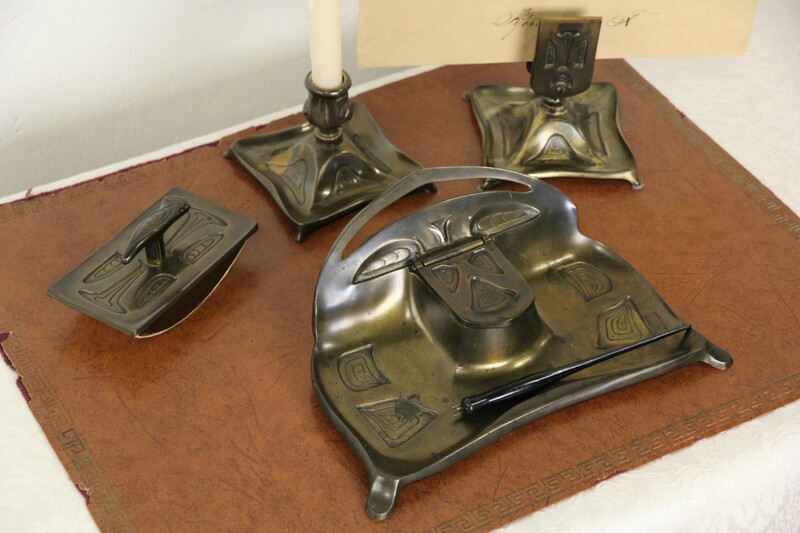 Signed "B&H" for famous lamp and metal work maker, "Bradley & Hubbard," this Art Nouveau 4 piece desk set dates from about 1900. The set includes an inkwell and pen holder, ink blotter, candlestick and matchbox holder. American made antique accessories, the original patinated dark bronze finish has a little wear for antique character, see photos. There was probably a glass or metal liner for the inkwell, now lost. Size of the inkwell is 10 1/2" wide, 7 1/2" deep and 3" tall, the matchbox holder is 4 1/2" square and 4 1/2" tall. USPS Shipping is $20.00 in the US.